We left Pedrouzo at a quarter to seven, our earliest departure yet, only because the Camino is its most crowded on this final leg we and we like to be alone. We followed a thin little woman in a long skirt who was walking briskly with a head lamp on. She lit enough of the trail for us to see the things we could trip over. A guy joined her for a bit and we listened to their conversation. He told her he believed in God. He believed in Jesus but he no longer believed in the Church and then he moved on. We stayed with her for the first hour and then ducked into a coffee shop along a road that we crossed. The woods were ghostly beautiful under the stars. After coffee Peggi used the flashlight on her phone and by 8:30 the sun was starting to come up. We stopped for a second cup in San Lázaro on the outskirts of Santiago. We had no time to waste because we were trying to get to the Pilgrim’s mass at noonat the Cathedral. We found our hotel, checked our bags, and headed over to the Cathedral. 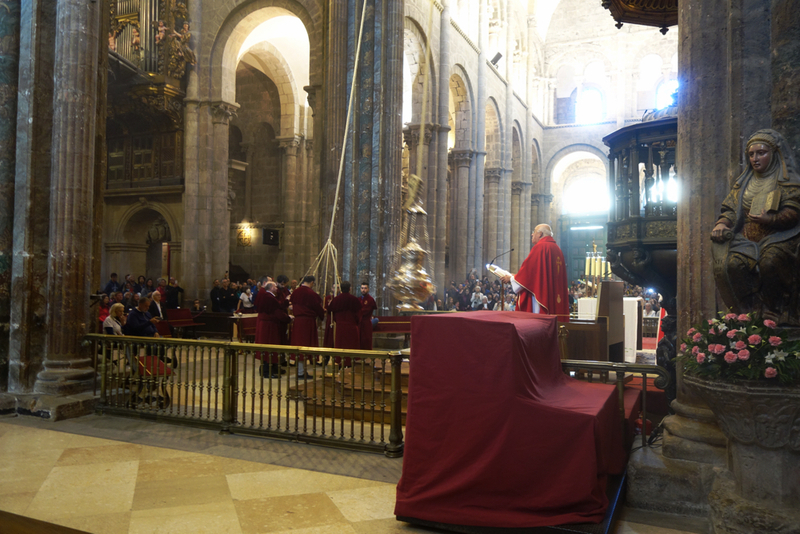 On high holy days or when a wealthy pilgrim pays the church, they will bring out the big incense burner, the Botafumeiro. We were lucky. They swung it today.